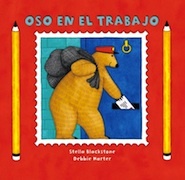 Oso en el trabajo is a Spanish language picture book that follows Oso, un cartero, as he delivers mail to the community. The rhyming text and beautiful illustrations lead children through a town populated by adorable bears. As Oso visits la florista, el panadero, el maestro and other workers, kids learn words for different professions. This Spanish story for kids is an excellent choice for children learning the language. Oso en el trabajo was written by Stella Blackstone and can be purchased on Amazon. Although the text of Oso en el trabajo does not follow a strict pattern, the verb llevar is repeated on most of the pages, with a direct and indirect object: Le lleva (cartas, paquetes, postales, etc) al (panadero, granjero, maestro). The meaning of this key phrase is always clarified and reinforced in the illustrations as you see Oso delivering the mail to each worker. All of the bears are shown at work, so parents and teachers have the opportunity to talk about the different places and what happens in each one. The text and illustrations of this Spanish story for kids lend themselves to a variety of language activities. Here are a few suggestions for reinforcing and expanding on the language in the book with children learning Spanish. Use the illustrations to clarify the meaning of the words in the text. Point to the pictures as you say the words. If the items are in several illustrations, use the words again as you talk to your child about the pictures. This vocabulary from the text is supported by the illustrations. You can point to illustrations in Spanish stories for kids to help them learn vocabulary even if the words are not in the text. Point to items in the pictures using complete sentences with verbs like veo and hay: Veo una abeja. Hay muchas flores. If the vocabulary is new, just point to the words as you say the sentences. When your child knows the words, you can ask ¿Dónde está..?, ¿Ves…? and ¿Puedes encontrar…? Use word families to help kids see the relationships between words and expand their vocabulary. Most of the words for professions in the story have root words that are common vocabulary. Those items appear in the pictures, so you can point to them and relate them to the words for the professions: Hay muchas flores. La florista vende flores. Veo pan. El panadero vende pan. La mesera lleva la comida a la mesa. At the end of book, there is an picture of all the professions with the question ¿Ves a estos osos en el cuento? This activity provides the opportunity to repeat the profession vocabulary and also mention the related words again as children look for the different bears in the story. Create an opportunity to use the language in the story through imaginative play. With a scene or model of the city in the story, children can use the words in the text as they play. There are different ways to create a city, including building a simple one with blocks. One of my favorite options is using paper bags as buildings. You can see a great photo of that craft here. I also love the printable paper city from Made by Joel. However you make your city, you will need to make paper bears to be your residents. – Hola, Florista. Las flores son bonitas. – Hola, Cartero. Gracias. ¿Hay cartas para mí? – Sí, tengo dos cartas para ti. Help children hear the rhyme in the story. Act out the story to reinforce and extend language learning. This Spanish story for kids lends itself to all kinds of play-acting. Children can play the parts of different workers, and the mail carrier can deliver letters. With preschoolers, this is a great game for practicing greetings. It is also good for name recognition if kids match names on letters to names on mailboxes. With older language learners, you can brainstorm common phrases for the different professions using the words in the text and other simple vocabulary. Playing charades is another fun way to act out worker vocabulary. Kids can choose a profession from the set at the back of the book and act it out. The others try to guess what profession it is. You can also have kids draw a word or phrase from a jar and act it out. In addition to the professions, you can include phrases using other vocabulary from the story: Lleva un saco muy pesado. Come pan. Le lleva flores a su mamá. Toma una taza de té. Postcards or letters make excellent writing projects for kids. They can draw postcards or use pre-made ones. I have a big collection of postcards from Mexico and Peru where they are given away as publicity for concerts and art exhibits. Kids can write simple messages in Spanish to family and friends. My daughter wants to be a rancher! My son wants to dance. I have a student who wants to be mayor! I have a student who wants to be president to improve relations with Cuba. My son says he wants to be everything when he grows up. I love that answer. He’s only four. My student wants to be an artist. I have a student that wants to be a crocodile hunter or a zoologist. My daughter wants to be an artist! My son (7) wants to be a motorcycle riding scientist specializing in volcanoes and tornadoes!! My daughter wants to be a ballerina and my son wants to be a doctor! My 4 yr old wants to be an archeologist or a dancer.